Among SEMA’s many member services is its Tech Transfer program, designed to help product developers and manufacturers design and create quality components and items for vehicles from original-equipment manufacturer (OEM) data files. The program traces its roots back to 1999, when Ford first provided vehicle blueprints to SEMA to share with association members. Now housed in the new SEMA Garage—Industry Innovations Center, the Tech Transfer program has grown to encompass a wide-ranging digital catalog of CAD files from Ford, GM, Scion and Chrysler (including Fiat, Jeep and RAM). While simple in concept, accessing the program may at first appear a little daunting for first-timers. To help explain its ins and outs, SEMA News sat down for a Q&A with Gary Pis, SEMA vehicle data product manager, who coordinates the program. The automotive aftermarket owes quite a bit to hot rodders. While, technically, the industry existed prior to the street scene of the ’50s, it was hot rodders who sparked the explosion of innovative performance and appearance products that now characterize the heart and soul of the automotive specialty-equipment market. They made tinkering with, modifying and personalizing cars cool, catapulting the industry into the $33-billion powerhouse it is today. And although the industry has since grown and broadened to encompass a dizzying array of products and trends in countless categories, hot rodding has hardly faded from the scene. The American automobile celebrated its 100th birthday in 1996. To mark the milestone, the Congressional Automotive Performance and Motorsports Caucus was formed to pay tribute to America’s ever-growing love affair with the car and motorsports. Nearly 20 years later, the caucus continues to raise the industry’s profile in the nation’s capital and in the public’s eyes. This less-disguised prototype ’16 Ford Fusion provides a good look at what’s in store for the model’s facelift. These photos of a ’16 Camaro prototype—caught while Chevrolet’s famous musclecar was slowed by construction traffic—offer a peek at some of the styling nuances in store for the all-new pony car. The Porsche Panamera hit the Nürburgring for some hot laps and showed off some new details for this next-generation model. Breaking news from SEMA member companies, including Tulsa Technology Center, Goodguys Rod & Custom Association. VIPAR Heavy Duty and more. Buyer registration for the 2015 SEMA Show, November 3–6 in Las Vegas, is open and available at www.SEMAShow.com/register . Distributors, retailers, installers and buyers are encouraged to refer to these simple tips to help ensure a fast and efficient registration process for the annual trade show. Forty-one SEMA-member companies participated in the first-ever overseas-based SEMA Garage, which featured an all-day measuring session for vehicles popularly customized overseas but not sold in the United States. The event, held at the Custom Show Emirates based in Abu Dhabi, United Arab Emirates (UAE), was part of the four-day 2015 SEMA Middle East Program. Businesses that reacted to Windows 8 with howls of incredulity can take heart: Microsoft is bending over backward with its next Windows release to win back the mouse-and-keyboard crowd. With Windows 10 (there will be no Windows 9), due for release in the summer of 2015, Microsoft will make it simple once again to navigate the operating system with a keyboard and a mouse. Moreover, the Redmond Goliath will be bringing back other features, such as the Start Menu that made Windows a hit in previous incarnations. “It’s a practical approach, which is ‘customer first,’” said Satya Nadella, CEO of Microsoft. New products in the mobile-electronics category at the 2014 SEMA Show ran the gamut from high-powered horns to connected-car and navigation aids. Each year, the electronics displays become more advanced and provide potential for increased revenue at specialty-equipment retail outlets. The latest offerings featured traditional automotive audio and video systems but also included interfaces for smartphones and tablets as well as vehicle maintenance technologies. Smartphones permeate American society. They’ve become much more than communications devices, providing Internet access for mobile e-mail, texting, navigation and dozens of applications ranging from dieting and exercise to photography and literature. From the very first SEMA Show in 1967, hot rodding has remained a highly influential niche within the specialty-equipment marketplace. That heritage was again on display at the recent SEMA Show’s Hot Rod Alley, where attendees were able to examine first hand the amazing parts and craftsmanship that go into custom-built rods. These are vehicles that can trace their lineage from post-WWII dry-lake racing, through the street scenes of the ’50s and the ’70s musclecar era, to the restomod movement of today. SEMA News: Why are you running for chair-elect on the SEMA Board of Directors (BOD)? Wade Kawasaki: I was 10 years old and working at my father’s gas station in L.A., watching musclecars and hot rods drive in and out, when I realized that this is my passion. My passion is what drives me, and it has been a dream come true to work and learn about everything in our industry, from manufacturing to distribution. I have had the opportunity to travel the globe doing business, attending cool car shows and speaking on behalf of the aftermarket. 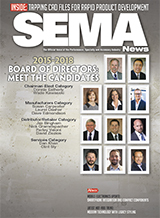 SEMA News: Why are you running for chair-elect of the SEMA Board of Directors (BOD)? Donnie Eatherly: I am very passionate about this industry and channels of distribution. I think my perspective would be good on all distribution-channel issues as well as how industry changes, policies and legislation affect how our products make it to consumers. In late 1963, Ed “Big Daddy” Roth was a busy guy. By that point in his career, he had built the Outlaw, Beatnik Bandit and Tweedy Pie—cars that established him as one of the premier (and wackiest) car customizers on the West Coast. Model maker Revell took notice of Roth’s creations and began offering scale versions of them as well as model kits of Roth’s freaky monsters, including Mr. Gasser, Drag Nut and Rat Fink.